Grandchildren – love them or loathe them? Of course we all love them, they are so special but oh so tiring. Three are staying over this Easter weekend. 18 month old woke several times in the night, mother said just leave him and he will settle – but that crying sort of gets to you. Older siblings too tired to eat dinner that nana cooked but trashed the room when put to bed! 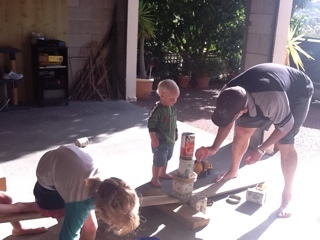 Great fun in the garage with Poppa – all the grandchildren love the garage. It does house the cars BUT it is full of hidden treasures. Who would imagine that old tea and coffee tins could create such fantastic towers which made a huge crashing noise when smashed to the ground. Isn’t it great to drag out the odd bit off 4 by 2 and make ramps for the old, cheap plastic dump trucks (bought for the beach but always forgotten and left tucked away in the garage). Those old stools – first made by my father, then by my husband, all the family have one of these stools all made to the same pattern – everyone loves them but everyone knows they are unstable – sit on them too close to one end and……..we all fall down. But what else would everyone use to sit on while the grandchildren play in the garage? Down comes the old swing, siblings fight over who should go first; then out come the old trolleys with the broken wheels followed closely by the cheap plastic lawnmower that all love. Master 9 and a half ( nearly 10 nana) remembers that it was bought for HIM but the other four also love it. Master 18months plays with it for hours – of course he has been given the latest with bells and whistles and everything else but he prefers the cheap old red plastic model. The garage – why do we invest in lovely decks and tiled outdoor areas – whenever our grandchildren come to visit their first choice of location is always “Poppa’s garage”. Despite the damp washing hanging on the saggy clothes lines, despite the dust, despite the wobbly stools, despite the dirt this is the place of happy memories for our five grandchildren. “Poppa – let’s sharpen some knives and see the sparks” “Poppa can you get down the old drill and let me make some holes in this wood” “Poppa what’s that hanging up there – can I see it?” and so it goes on – this place is a veritable Aladdin’s cave for them. Unfortunately it holds no magic for me – it is just a place where Poppa stores everything that I try to throw out! Today the white one (westie) recovered from the disaster of devouring a polystyrene meat tray and I recovered from the worry of seeing her unwell. The other fluffy one in the family was lonely and happy to see her companion back from the day at the veterinary clinic. Today I started my first blog – when I travel I love to talk to my family and friends about the highlights of the day, about the places I have seen and about the beautiful places I have visited. I am hoping that this is a better way to let everyone know about my travels, my interests and my love of shopping! Today we had a touch of winter, we have had a beautiful summer in New Zealand but I guess as the nights close in and the mornings are fresher we know that winter is just around the corner. While I love summer winter brings its own beauty – and of course the excuse to update my wardrobe (it is rather large) from the latest range of winter fashions. Today my friend at work resigned – she is joining the great numbers of kiwis who are defecting across the Tasman.